How much does it cost to deliver my fruit? What are the different kinds of Florida fruit and when are they in season? How large will my pieces of fruit be? What is the difference between regular fruit and Sugar Baby fruit? Why does my fruit have a slight greenish tint? Is it ripe? There are marks on the skin of my fruit. Is it OK to eat? Why does my fruit have a wax coating? Is my Gift Fruit guaranteed? What is the best way to store my citrus and how long will it keep? Can I freeze whole Oranges? How many pieces of fruit will I receive in each box? Can I add Grapefruit to my order of Sugar Baby fruit? Can I customize my gift with a special greeting? Who will deliver my gift? How long will it take for my fruit to arrive? What is the cut-off date for Holiday Shipping? Do I have to pay two shipping charges to send two gifts to the same person? Shipping and handling to the 48 contiguous United States is $12.99 per gift. Shipping and handling to Canada is $22.99 per gift. WE DO NOT SHIP TO HAWAII, ALASKA OR CANADIAN POSTAL CODES T THROUGH V. WE DO NOT SHIP CITRUS TO ARIZONA. Florida fruit is available almost all year ‘round. Gregory’s offers many favorites and each has its own unique flavor, size and shape. Varieties of Florida Oranges, Grapefruit and Tangelos ripen at different times of the year and even though we try to predict when a certain type of fruit will be ready, Mother Nature sometimes varies the ripening process. So please, always inquire to see if your choice is still available. Let us tell you a little bit about each variety of fruit Gregory’s offers, to help you select a favorite for your gift! Vibrant and golden gems, Fall Tangerines are ripe and ready to enjoy in early autumn. And, their taste lives up to their good looks. With an easy-to-peel “zipper” skin, tangerines section with ease and each piece is as temptingly sweet as candy! The perfect fruit to begin the holiday season! Bright, bold and juicy! The fruit that says “Florida!” Navel Oranges are recognized by their distinctive “belly button” navel end, a “sign” that you’ll be slicing into a sweet, seedless piece of fruit. Each is hand-selected at the peak of its flavor, gift-packed and sent directly to you. No wonder Navel Oranges are the fruit that our customers always request to give for that special occasion. Good days begin with Ruby Red Grapefruit! Big and bright yellow with a rosy blush on the outside, Ruby Red Grapefruit have prized, sunset red fruit inside. So sweet – no need to sprinkle any extra sugar on a Ruby Red Grapefruit. Each one is wholesome, nutritious and, of course, absolutely delicious! We’ve captured the rich reds and golds of the Fall with our Ruby Red Navel Orange...the perfect Thanksgiving fruit! Looks like a classic Navel Orange on the outside, but, cut one open and you’ll be surprised to discover the luxurious deep red color of the Ruby Red Grapefruit inside. The superb flavor of the Navel Orange shines through in every juicy slice! You just won’t find these unique beauties in a supermarket. A delicious indulgence! A Grapefruit that’s highly prized for its beauty and perfection. A MUST HAVE for those who REALLY love Grapefruit! Incredibly juicy and heavy with sweet golden flesh, the Imperial Gem has a mellow, less acidic flavor. Definitely a favorite of Florida natives! If you’ve never tried an Imperial Gem Grapefruit, don't miss this opportunity. It may just be the finest Grapefruit you’ll ever eat! You’ve waited all year and January has finally arrived....IT’S HONEYBELL SEASON!...the time of year to savor the incomparable taste of Gregory’s famous Honeybells. Zip off the deep, red-orange peel and there’s the reward...fruit sections bursting with juice...a indescribable taste that’s as sweet as can be. Try just one and you’ll know why the demand for this fruit is so great and why the supply seems to run out before January comes to an end. And, every Honeybell-lover knows that since Honeybells are only available for a few short weeks in January, they must order early and so should you. Celebrate January...the Honeybells are here! They may be smaller in size than the Honeybell Tangelo, but Sugar Baby Honeybells are really BIG in flavor and value. Every bit as sweet, definitely as juicy and just as much fun to peel and eat, Sugar Babies are perfectly sized for kids...and grown-ups too! Brighten up those last few days of chilly winter weather with a sunny Temple Orange. It’s so easy to zip back a piece of fragrant, pebbly orange-red peel and bite into a mouth-watering section. The taste is robust and rich. You’ll know right away why Florida natives swear that the Temple Orange is the “best eatin’ fruit” around! Florida’s warm Spring sunshine and cool, balmy nights produce the appealing Honey Tangerine...a fruit that’s as sweet as its name. Honey Tangerines are a great snacking fruit. Hold one in your hand, peel back the thin skin and pop a sugary section right into your mouth. ”Honey sweet” and bursting with juice, every bite is like a eating a piece of orange candy! It takes an entire growing season of sunny days and warm nights to produce Florida’s most famous juice Orange. The wait is worth it! Cut a fragrant Valencia in half and squeeze the rich golden juice into a tall, chilled glass. A delicious glass of sunny Vitamin C! Or, enjoy the grove-fresh flavor of a Valencia Orange sliced or eaten out of hand. Any way you choose to eat them, Valencias are a spectacular Springtime treat! We do our best to pack the largest pieces of fruit available. Size depends upon the grove where the fruit was grown with a little help from Mother Nature...rain, temperature, sunshine, etc. But always keep in mind, the size of the fruit does not affect the quality. The only difference is the actual size of the fruit. Gregory’s Sugar Baby varieties are about the size of a tennis ball. Regular citrus varieties can range from the size of a baseball to the size of a softball. The flavor and taste are identical. All oranges and grapefruits ripen on the tree and are only harvested when they are as delicious as they can be. When it’s cold, Florida fruit turns orange-gold in color. During a warmer than normal Winter or an early Spring, fruit may have a light yellow-green hue. Certain varieties, like Valencias, often have blossoms and ripe fruit on the tree at the same time. All the extra chlorophyll necessary to form new fruit, will “re-green” the mature, ripe fruit on the branches. A greenish tint here or there in no way affects the fruit inside. Don’t worry, your Orange or Grapefruit is still ripe, juicy and sweet. Florida’s gentle breezes often brush fruit ripening on the tree against branches and leaves, scratching the thin, tender skin. This causes a blemish called “wind scarring.” Rest assured, your Florida fruit is fresh and delicious. After your oranges and grapefruits are hand-picked, they are cleaned and sorted in the packing house. This thorough washing removes some of the naturally protective oils and wax. In order to extend its shelf life, we re-coat the fruit with a very small quantity of food grade, non-animal source wax. (The waxes have been tested and approved for use on foods and meet the requirements of the U.S. FDA.) Your fruit will stay fresher, longer. All of our fruit is inspected by the State of Florida and must meet the highest standards of the Florida Department of Citrus to be qualified as Gift Fruit. All of our gifts come with a 100% Guarantee. If you are unhappy in any way with your selection, we will replace your order and make it right. A Quality Control card is packed in each box. We request that the recipient fill out and return the card to let us know the quality of the fruit they received. OUR GUARANTEE IS ONLY APPLICABLE IF WE ARE PROVIDED ALL THE CORRECT INFORMATION. WHILE WE MAKE EVERY EFFORT TO SEND EACH GIFT AS SHOWN, WE RESERVE THE RIGHT, IF NECESSARY, TO SUBSITUTE PRODUCT WITH EQUAL OR GREATER VALUE. YOUR GIFT MAY NOT BE PACKED AS SHOWN. Citrus is ripe and ready to eat when it’s picked. It will not ripen further or become more orange in color. The best place to preserve the fresh taste of Florida citrus is in the crisper drawer of your refrigerator. It will stay fresh for two to four weeks. Otherwise, store away from heat in a cool, dry place. Citrus needs good air circulation, so don’t put your fruit in a plastic bag or plastic wrap. However, you can and should keep a few in a bowl ready to eat on your kitchen countertop. When whole fruit is frozen, the juice expands and bursts the cells inside. When the fruit thaws the pulp will be dry and the peel will be mushy. Whole citrus does not freeze with good results. However, you can squeeze, then freeze orange and grapefruit juice. Unfortunately, no. Sugar Baby fruit is packaged in special boxes designed just for them. Each box holds 20 pieces of fruit. A Florida Grapefruit can’t fit in a Sugar Baby Box! At Gregory’s it’s very easy and INEXPENSIVE to make your gift of Florida citrus even more special! We will add our Deluxe Collection: one 5 oz. jar of Orange Marmalade, one 5 oz. jar of Honeybell Marmalade, and one 8 oz. box of Florida’s famous creamy Coconut Patties to most of our standard 1, 2,3, or 4 trays of citrus for an additional charge of only $9.99. We also have a Baby Deluxe Collection: one 3 oz. jar of Orange Marmalade, one 3 oz. 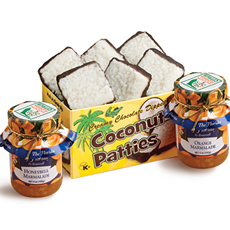 jar of Honeybell Marmalade, and four individually wrapped Coconut Patties to most of our Sugar Baby boxes for an additional charge of only $5. PLEASE KEEP IN MIND WHEN ANYTHING IS ADDED TO A BOX OF CITRUS, FRUIT MUST BE REMOVED TO ACCOMMODATE THE ADDED ITEMS. All of Gregory’s gifts are packaged in crush-proof boxes to protect the fruit during shipping. Fruit is always hand-packed in gift trays. Order two or more gift trays and those trays are placed into a larger carton for shipping. Each individual tray can easily be given as a separate gift. Our cartons are sealed and inspected to make sure your gift arrives just like we packed it. You have the ability to add a personalized greeting to every gift you choose at Gregory's Groves. What is a Honeybell Announcement Card? Order your Honeybells now and during the Holiday season, Gregory's will send a special card to your recipient that says "Your Honeybells will arrive in January!" Our fruit packs are delivered by the Unites States Postal Service. Several of our specialty gifts are shipped via Fed Ex or UPS Ground. Perishable items (such as our Honeybell Cheesecake) are shipped via Fed Ex. Once the gift leaves our facility, it takes approximately 5-7 days for delivery to the 48 contiguous United States and approximately 7-10 days to Canada. Your gift is transported in climate-controlled trucks to the Post Office that corresponds to the shipping ZIP Code. A neighborhood letter carrier will bring the gift to your door, or leave a notice for you to pick it up at your local Post Office. YOUR REQUESTED ARRIVAL DATE IS JUST AN APPROXIMATE DATE. WE MAKE EVERY EFFORT TO HAVE YOUR GIFT ARRIVE AS CLOSE TO YOUR REQUESTED ARRIVAL DATE AS POSSIBLE. HOWEVER, WHEN SHIPPING FRESH CITRUS, THERE CAN BE DELAYS FOR REASONS BEYOND OUR CONTROL (MOSTLY MOTHER NATURE). WE GUARANTEE YOUR ORDER WILL ARRIVE IN EXCELLENT CONDITION. In most cases the answer is “Yes.” Each gift is packaged and shipped in a box designed for that gift. Please check with us for any exceptions.